WHAT IS A BINARY WATCH? A binary clock displays the time in the language of computers, the binary system. It contains only ones and zeros, but you can easily transform it to our normal numeral system. HOW DO YOU READ THE WATCH? The top-row shows the current hour. The LEDs represent 8, 4, 2 and 1. The bottom-row displays the current minute and the LEDs represent 32, 16, 8, 4, 2, 1. Just add up the glowing numbers and you are done! ABOUT THE WATCH - To save energy, the LEDs only glow after you've pressed the button at the side. The plastic wristband is adjustable between 5.5 inches and 8.2 inches. The watch needs a CR2032 battery, which is included and can easily be exchanged. A PERFECT GIFT - Everyone in IT and science will love this watch, which makes it the perfect geek & nerd present and even the perfect gift for men and women in general. ORIGINAL GETDIGITAL - The watch was exclusively designed by our getDigital designer, which is why you won't find it anywhere else. The design depicts a circuit board whose soldering points are the LEDs that display the time. This Geeky LED binary watch displays the time in the language of computers. 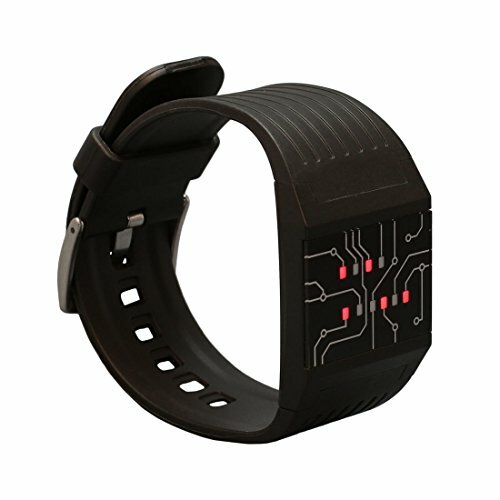 Only those who really understand binary code will be able to read the LED binary watch. It’s a for sure way to make sure your watch is never stolen…genius!